Rocking horses are fun. Jared and Zachary had one stationed in the corner of their room as toddlers. They loved to go back and forth at warp speed, the faster the better. Initially, they needed help getting on the horse and staying on but over time they mounted the horse on their own. Thank the Lord, no one was ever injured falling off the horse or entrapped in the springs. 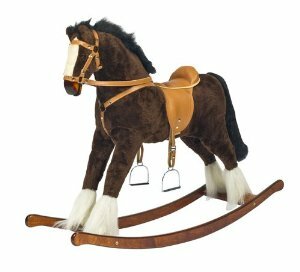 A stationary horse lends itself to fewer accidents. Eventfully, they moved on to electronic toys. The rocking horse had served its purpose and was retired to the Salvation Army. It was time to leave the rocking horse behind. It is foolish to think you can go forward by rocking back and forth or by repeating the same folly over and over again. There is a negative side to rocking horses. No matter how exhilarating or bumpy the ride, when you get off the horse, you are in the same place where you started. A rocking horse takes you nowhere. Your ride is unfruitful. You are no further along than when you first began. Stationary horses are usually where you find riders young in the faith, but mature saints are expected to move forward. Making the same mistake over and over expecting a different result is the characteristic of a fool not a believer. Choosing the same type of man with a different name, changing friends but going to the same club, switching jobs with the same workplace mentality in a sense mimics rocking on a horse going nowhere fast. Stop getting back up on the rocking horse and certainly don’t allow your friends to help you back up into the saddle. Grow up in the Lord and leave that horse (mistakes) behind.